One of my main memories of attending a workshop with Andrew Morrish is the playful atmosphere of permission, in which creativity just seems to ooze out of everyone. It was wonderful to have a long chat with him, go deeper and learn about his values and his thinking around improvising as performance. Here is the distilled essence of that conversation, for sure motivating and inspiring! Andrew will be teaching in Berlin on February 2nd-4th 2018 and in other European cities until April. Check all his dates here. 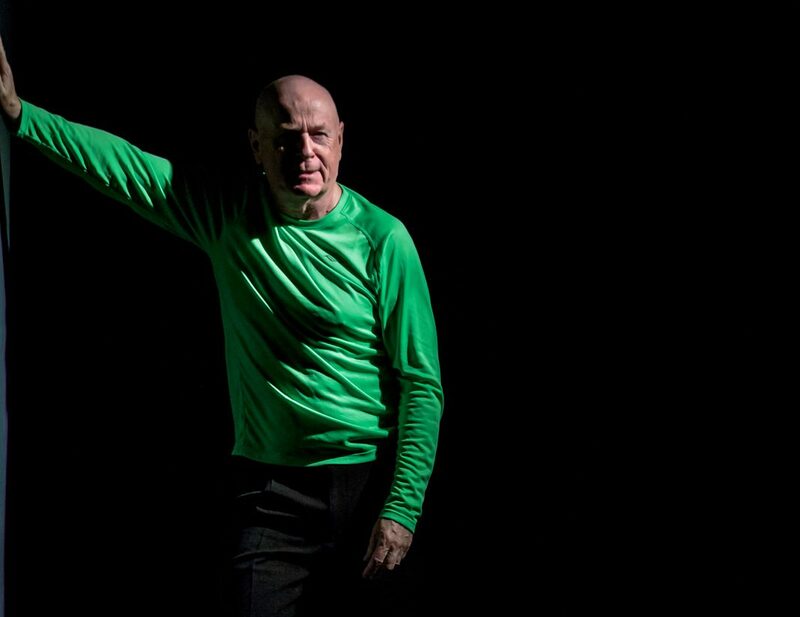 “For me the artistic destiny of Performance Improvisation lies in extended solo performances”. A.- With solo we don’t have the complication of whose art it is and I like taking responsibility for the art I make. Improvisation is being used as a set of tools by other art forms, so now I’m turning it the other way around; I see improvisation as its own form. My job is to find the content in front of the audience every single time. Some people don’t even know this exists or is possible, and that’s why I’m articulating on behalf of improvisation as a separate art form. Dance is about movement, music is about sound and I think theatre is about psychology. For me improvisation is about making art with now, about making this moment the most important thing. I’m not there to tell people how I feel, I’m there to make art with what I feel. Sometimes this means I say things I absolutely don’t believe because the moment requires it and there’s some shadow in my value system that is being expressed then. It is all driven by my need to communicate, not just my need to find something new, or not to be bored. That triggers something in me which gets the whole thing going. Q.- If improvisation were a separate discipline of its own, could it be so improvised that any skill -dance, music, theatre- could come in? And if so, how do you find the balance between structuring these interventions and letting things flow? A.- Yes. As a human there’s a dancer in me, there’s a musician in me, there’s an actor in me… I’m trying to check through all my systems and allowing them to interrupt each other. Just like in a good ensemble, you have to make sure that the quiet little voice gets its chance. In terms of structure, I love temporal structure, that everything has a beginning, a middle and an end. That means that everything I’m doing has three parts, so I’ve got three things to work with. It’s a great way to multiply content and to open up spaces in which I might decide to change. Also every piece has a beginning, a middle and an end, and the beginning also has a beginning, a middle and an end. So I can be at the beginning of the beginning, the middle of the beginning… etc. you can go completely bonkers eventually! For me the beginning is about noticing and immediate sensation. The middle is about making what you notice more explicit, turning it into content. The end mind involves stretching your consciousness over the whole thing. This is the structuring mind that allows me to step back a bit and make a strategic decision. Once this is understood, then these three ways of working become tools you can use at any time in a piece. Mostly I’m finding and making material, and only every now and then I notice a pattern or remember something. This end mind is what manages the danger of doing a bad improvisation and in a 55-minute piece I use it only for three or four minutes. Q.- How do you relate to the idea that improvising is about being free? A.- I give people permission to start from there, but if you’re still doing that thirty-five years later, there’s something wrong, that’s only first level. I don’t even know what it means either. I engage with constraint towards creativity, not freedom at all. You say, “you can’t go there”, so you go somewhere else and see what interesting bits you can find. The difficult improvisations are usually the best ones. I think for years and years I was training to make it easy, but then… easy… becomes lazy. Q.- What pushes you out of “easy” or the known groove? Q.- How do you deal with this vulnerability? A.- If the safety of what I normally do is really an adaptive response to being in front of that audience, it’s fine. If you don’t let yourself do that, you may feel very exposed afterwards, and if you do that too often, you start going, “I don’t like doing this”, and then you stop altogether and you don’t grow. Taking the long view helps me with that. The beginning of knowledge is a feeling that there’s something more. The best you can do is let that uneasy moment be seen. Gradually that door opens up and five years later you’re playing in there. A.- When I say texture I mean the combination of something next to something else. If I get a feeling that I’m being mono-texture, for example eighteen minutes talking about one thing, that makes me anxious. That’s not how my mind actually works, so I must be doing something to myself to stay there. For me that’s bad improvising, holding on beyond the vitality of something, rather than allowing interferences and shifts. In the beginning I generally let myself jump from one thing to another without finishing anything, so a texture emerges for me to work from. What’s happening in my brain is how a relaxed brain naturally works: it jumps from one thing to another. I think all the other brains in the audience go, “Yeah, that’s what we do! That’s what brains do!”, it kind of makes sense, even if they don’t know what it means. People will often say, “it’s amazing how everything gets tied together in the end in your solos”. But I don’t think so, there are lots of dead ends. They’re doing the connecting. Q.- What can you say about the humour in your performances? A.- I make people laugh and I don’t think I’m funny. Maybe there’s something ridiculous about the way things are organized inside me. I love that laughter, it works like a lubricant which is opening the process to go further, because I’m interested in more than that. I was always happy if the audience cheered, but I was much happier the day they cried, so for about seven or eight years I worked on emotional range, making sure that I was touching more than one emotional quality. I don’t think it’s visible from the outside, but I think the strongest member of my ensemble is the movement awareness; it’s the most reliable and familiar, and it’s the one I can articulate best. The long term shape and form of what I’m doing is my responsibility, so I’ve got to keep practising to keep the texture of what I’m doing shifting.